At Villa del Palmar Flamingos Beach Resort & Spa, you can enjoy a range of exciting Nuevo Vallarta resort activities idyllic for every age group. Our onsite resort activities cater to the interests of foodies, fitness fans, our youngest guests, and everyone in between. There are so many exciting things to do at Villa del Palmar Flamingos, you may never want to leave the Nuevo Vallarta all inclusive resort. What better place to learn Spanish than at your Nuevo Vallarta all inclusive resort where you’ll be able to practice what you learn? Return home ready to prepare your favorite Mexican dishes, including Ceviche, Guacamole, and Paella, using tips from our amazing chefs. Enjoy the stunning surroundings during our guided stretching sessions that will help you loosen up! A unique twist on an old time favorite. Create a variety of arts and crafts using recycled goods and eco-friendly materials. Bump, set, and spike your way through your Nuevo Vallarta vacation! Enjoy some of your favorite movies on the big screen under a star-filled night sky every Sunday. The same great exercise in the pool, just geared toward our younger guests. Twist, pull, and shape balloons into a number of interesting figures. Help your kids learn the skills they need to survive in the wild during this entertaining class. For a relaxing time, enjoy putting together puzzles with other kids at the resort. They say coloring is one of the best ways to release stress, which is just as effective for little kids as it is for adults. Color, relax, and enjoy your Mexico vacation. Everyone loves a slice of pizza, especially when it is made with your own two hands. Learn how to build a kite and then fly it on Flamingos Beach. Allow our professional gardeners to teach you a thing or two about caring for plants. An exciting way to spend the afternoon. Grab a pole and reel in fish from the shore of the resort. They say learning a language is easier when you’re young. Put that idea to the test during Spanish classes that will teach you all the local lingo. Learn the steps to some of Mexico’s most iconic dances. Take a tour of the kitchen of one of the best Nuevo Vallarta restaurants. Try your hand (and your feet) at one of the most popular fitness activities in Mexico. Who will fill their board first? Just make sure you can keep up! Learn the best massage techniques to try out on mom and dad from our professional spa therapists. Get in shape while refreshing in the resort’s main pool. Tuesday night is your chance to test your skills in a variety of fun games that give you just one minute to conquer. Enjoy everything from the latest beach fashions to traditional Mexican clothing during our entertaining fashion shows. 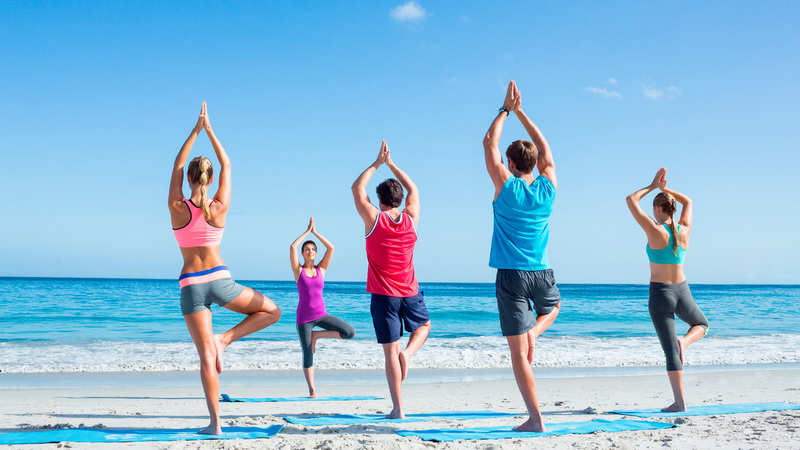 There is no better place to release stress during a session of yoga than on the beach in front of our Nuevo Vallarta all inclusive resort. Engage in a battle that is more fun than you could imagine! Discover the treasures hidden during our amazing treasure hunt. The most entertaining workout you’ll ever try. Visit our Sport Bar for some live entertainment as the DJ spins his tracks. What kind of sand castle creations can you design? A refreshing competition that will keep you moving. Visit the beach in front of the resort for some salsa music and incredible dancing. Hit me! Try your hand at a friendly game of blackjack by the pool during your Nuevo Vallarta vacation. Pick your design and wear it with pride for the rest of the day. Same great sport, totally different experience. Decorate your own cookies and taste them afterward. Who is up for a belly flop. Make the biggest splash and win a prize. Break open a traditional Mexican piñata for a wealth of treats! Whose plane can fly further than the rest? Learn how to make the fun towel figures you find in your room all the time.